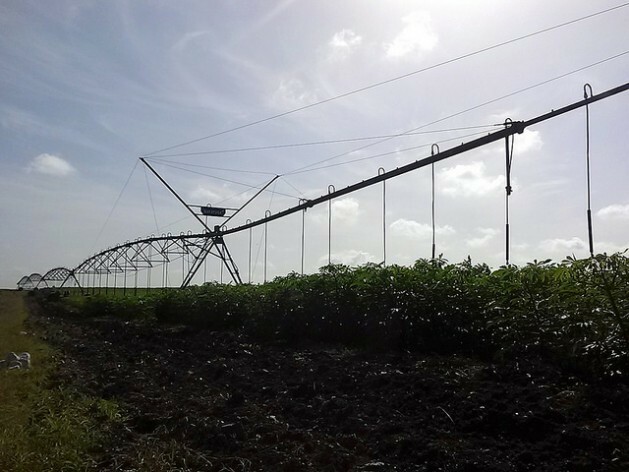 HOLGUÍN, Cuba, Jun 28 2016 (IPS) - Five gargantuan modern irrigation machines water the state farm of La Yuraguana covering 138 hectares in the northeastern province of Holguín, the third largest province in Cuba. 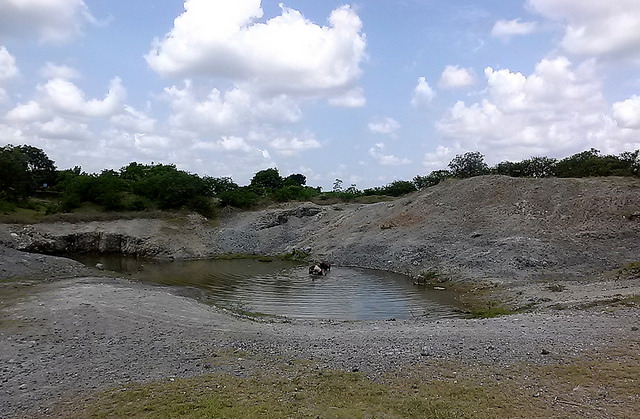 However, “sometimes they cannot even be switched on, due to the low water level,” said farm manager Edilberto Pupo. “The last three years have been very stressful due to lack of rainfall. We take our irrigation water from a reservoir that has practically run dry,” Pupo told IPS. In 2008 La Yuraguana received new irrigation equipment financed by international aid. Central pivot machines are a form of overhead water sprinkler that imitates the action of rain. The machinery is assembled in Cuba using European parts. Since late 2014 Cuba has endured the worst drought of the past 115 years. The extremely dry weather has sounded an alarm call drawing attention to the urgent need to modernise and change water management practices in response to climate challenges, and to other problems such as water wastage from leaky supply networks, inefficient water storage and conservation policies and absence of water metering at the point of use. National reforms begun in 2008 have not yet achieved the hoped-for lift-off in agricultural production. Farming, however, is the main consumer of water in this Caribbean country, responsible for using 65 percent of the island’s total fresh water supply for irrigation, fish farming and livestock. Future difficulties loom on the horizon, because droughts are becoming more seasonal in nature in the Caribbean region due to climate change, according to a new report by the Food and Agriculture Organization of the United Nations (FAO) published June 21. The Caribbean region accounts for seven of the world’s top 36 water-stressed countries, FAO said. The eastern part of Cuba suffers most from droughts, and its population, alongside small farmers in Holguín province, has its own methods of addressing the problem of lack of rainfall. They say that in extreme droughts, irrigation equipment is of little use. 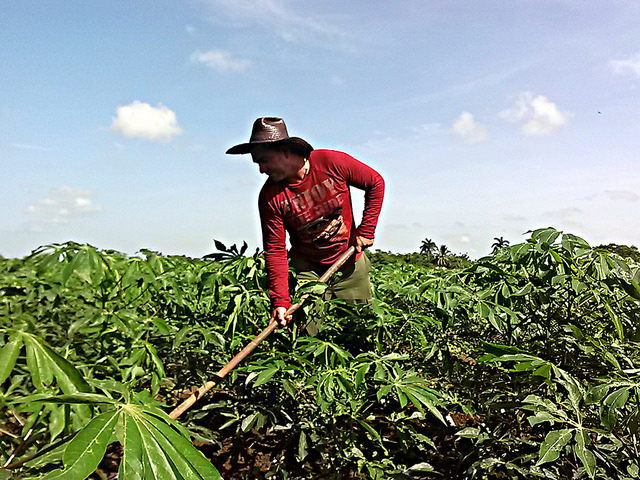 “At the most critical time we had to plant resistant crops like yucca (cassava) and plantains (starchy bananas that require cooking) that can survive until it rains,” Pupo said, speaking about the cooperative farm which sells vegetables, grains, fruit and root crops to the city of Holguín’s 287,800 people. La Yuraguana employs 93 workers, 14 of whom are women. Its 2016 production target is 840 tonnes of food, for direct sale to markets in the city of Holguín, in the adjacent municipality. “We hope Saint Peter will come to our aid, that the rains will come and fill the reservoir, so that we can water our crops and keep on producing,” said Pérez. Devout rural folk call on Saint Peter, whose feast day is June 29, to intercede on their behalf because they believe the saint is able to bring rain. Cuba’s total agricultural land area is about 6.24 million hectares out of its total surface of nearly 11 million hectares. Only 460,000 hectares of arable land is under irrigation, mostly with outdated equipment and technology, according to the government report titled “Panorama uso de la tierra. Cuba 2015” (Overview of land use: Cuba 2015). At present only about 11 percent of the land used to raise crops is irrigated, but FAO forecasts that by 2020 the area equipped for irrigation will nearly double, to some 875,600 hectares, through a programme launched in 2011 to modernise machinery and reorganise farm irrigation and drainage. Use of irrigation increases average crop yields by up to 30 percent, experts say. Cuban authorities want to boost local production in order to reduce expenditure on purchasing imported food to meet demand from the island’s 11.2 million people, and from the influx of tourists – there were three million visitors to Cuba in 2015. The bill for imported food is two billion dollars a year. Cuba is not blessed with any large lakes or rivers, and so is reliant on rainfall, captured in 242 dammed reservoirs and dozens of artificial minilakes. Local experts agree with FAO’s Friedrich that over-exploitation of underground water reserves should be discouraged because of the risk of causing salinisation and losing fresh water sources. The present drought in Cuba was triggered by the El Niño/Southern Oscillation (ENSO) climate phenomenon, which has had devastating effects in Latin America this year. Shortage of water has affected 75 percent of Cuban territory, according to official sources, with the worst effects being felt in Santiago de Cuba, a province adjacent to Holguín. In spite of steps taken to put the water consumption needs of people before agricultural and industrial uses, one million people experienced some limitation on their access to water in May, said the state National Institute of Water Resources. On June 20 the European Union announced an additional grant of 100,000 euros (113,000 dollars) to Cuba via the Red Cross, as disaster relief for 10,000 drought victims in Santiago de Cuba. The funds are intended to improve access to safe drinking water and to deliver transport equipment, reservoirs and materials for water treatment and quality control. However, many of those responsible for the agriculture and small farming sectors still see irrigation as the key to boosting production. “Yields under irrigation when necessary are much higher than when one just waits for nature to take its course,” said Abdul González, deputy mayor in charge of agriculture for the municipal government of Holguín. Unfortunately “80 percent of our land under crops lacks irrigation,” he told IPS. “Small farmers from all forms of agricultural production (state, private and cooperative) are demanding irrigation systems. Some of them resort to home made tanks and ditches to mitigate the negative impacts of the drought,” he said. At the Eduardo R. Chibás Credit and Service Cooperative, not far from La Yuraguana, Virgilio Díaz, one of the cooperative’s beneficial owners who grows garlic, maize, sweet potato, papaya and sorghum on his 22-acre plot, ascribed much of his success to the irrigation system bought in 2010 by the 140-member cooperative. “Income went up by over 70 percent: we raised salaries; I was able to request a lease on more land and I built a new house,” Díaz said. He and five other workers between them produce 200 tonnes of food a year, when the climate is favourable.